After last week’s announcement of the discovery of two long-lost Boston Blackie stories, it’s difficult to follow up with anything nearly as exciting this time around. But I have managed to dig a special treat up from the depths of the archives. Scads of pictures exist of Boston Blackie in his various onscreen incarnations. But presented here, for the first time in 93 years, is a photo of Jack Boyle on the set of a Hollywood production. 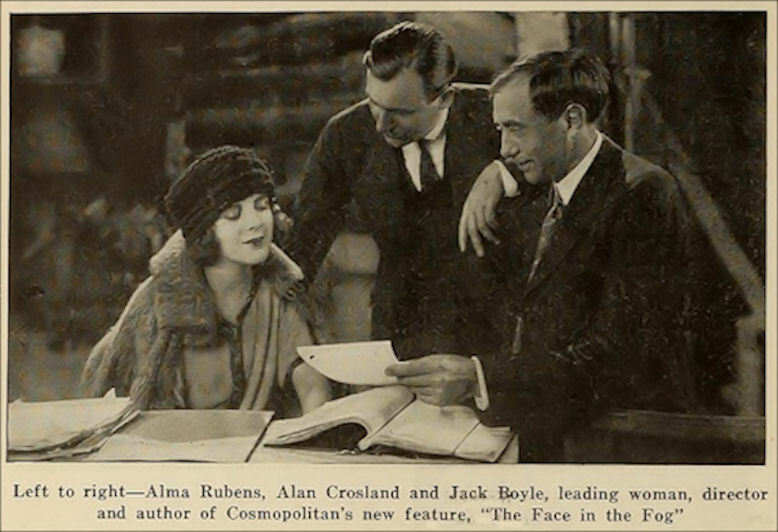 This image was first presented in the July 1, 1922 issue of the motion picture industry publication Exhibitor’s Trade Review, as part of their coverage of the big budget Boston Blackie feature THE FACE IN THE FOG. Few photos of Boyle are known to exist today, so it’s fascinating to find one presenting him collaborating on bringing one of his stories to the silver screen. BREAKING NEWS … An Exciting Boston Blackie Discovery! How many Boston Blackie stories did Jack Boyle publish? This has been a point of contention for years. H.K. Fly’s often-reprinted 1919 collection presented seven Blackie tales, which for nearly a century were the only specimens of Boyle’s writing available in book form. But when this volume was republished by Gregg Press in 1979, Ed Hoch’s introduction to the new edition pointed out that further Blackie exploits were chronicled in the AMERICAN, RED BOOK and COSMOPOLITAN magazines. Ultimately, examinations of these periodicals brought to light another fourteen Blackie yarns, increasing the series’ total count to twenty-one. For years, this was thought to represent Boyle’s complete output on his most celebrated creation — until the advent of the internet. In the 21st century, research online revealed a “missing” Blackie story, serialized in THE LOS ANGELES TIMES five years after Boyle published his last story in THE COSMOPOLITAN. This curtain call to the Boston Blackie adventures was eventually reprinted in Coachwhip Publications’ 2012 collection BOSTON BLACKIE & FRIENDS, definitively setting the count of the complete Blackie saga at twenty-two. I’m thrilled to announce the discovery of not one, but TWO hitherto unknown Boston Blackie stories, both from the pen of Jack Boyle. The pair, written in a period during which Boyle’s literary output had primarily turned away from his rogue hero, has languished for more than ninety years in the pages of a publication not typically associated with the author. Through a kindness of Providence, their existence was discovered in time to allow for their inclusion in my upcoming collection THE COMPLETE BOSTON BLACKIE. Of course, preparing the texts for publication will mean a further delay in a project that is already behind schedule, but I’m happy to run beyond my original deadline if it means presenting all twenty-four installments of the Blackie canon in their entirety.